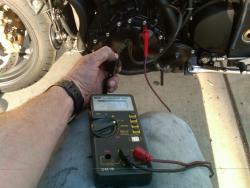 I have finally found some time to write this MotoHowTo. My Triumph Speed Triple's R/R + stator have finally gave up their collective ghost (a known problem with this model of motorcycles) and so, together iwth stator replacement I used this opportunity to perform R/R upgrade from the OEM SCR based ( read cheap) R/R, to a MOSFET based, Shindigen FH012 R/R that is used in numerous Yamaha, Kawasaki and a few other motorcycle models. 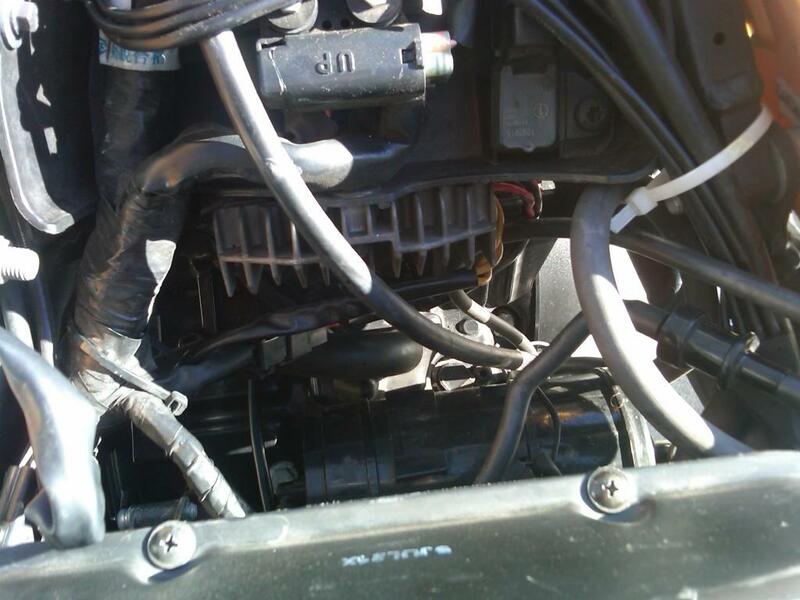 I began the troubleshooting process with checking the health of the alternator (in hopes that alternator is o'k, and it's only an R/R failure), as swapping out an R/R is a much easier and faster job then replacing the alternator. 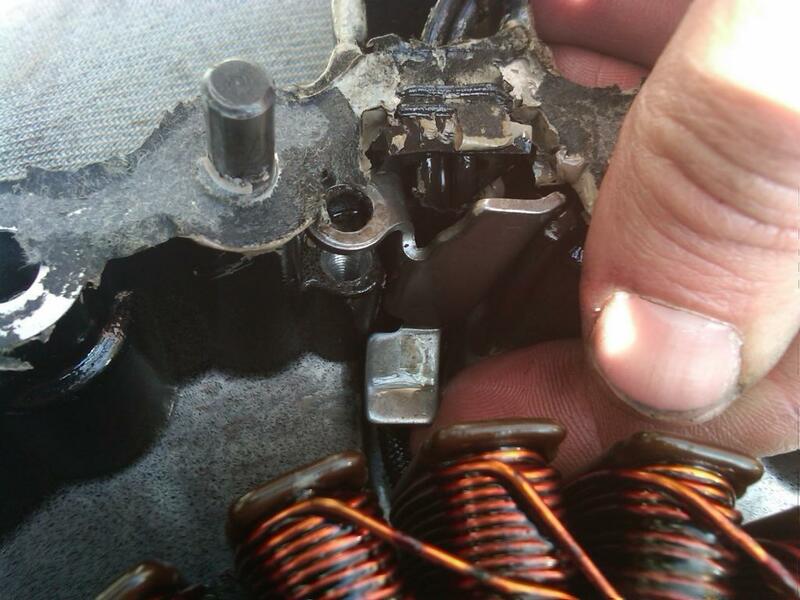 I unplugged the stator connector from the R/R (3 yellow wires on the R/R side and 3 black wires coming from the stator) and checked the resistance between each of the 3 pins on the stator connector and the engine ground (see pic below). 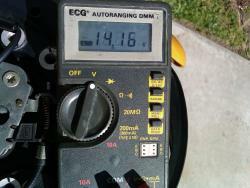 My multi-meter beeped and showed the resistance of 0.07 Ohm. Which means a SHORT for all intents and purposes. I repeated that for all 3 pins and and all of them showed SHORT to the ground. 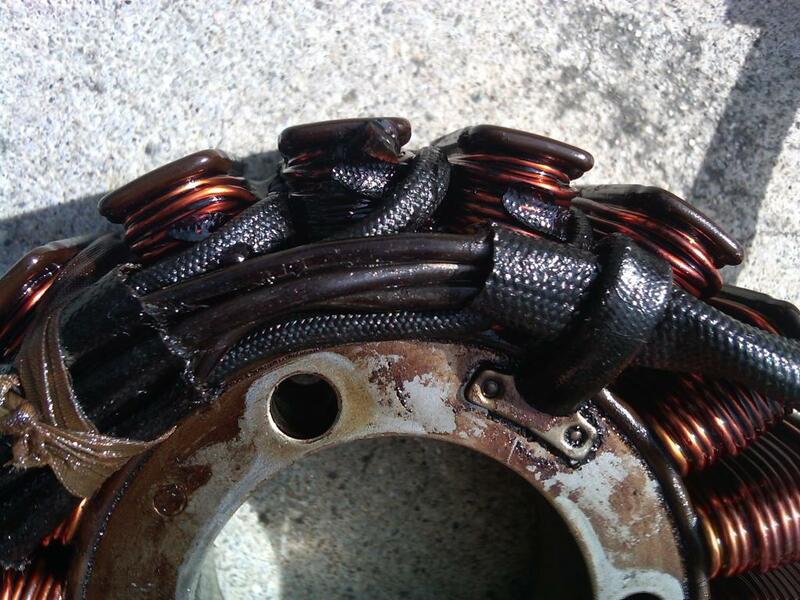 It meant - my stator is "dead". 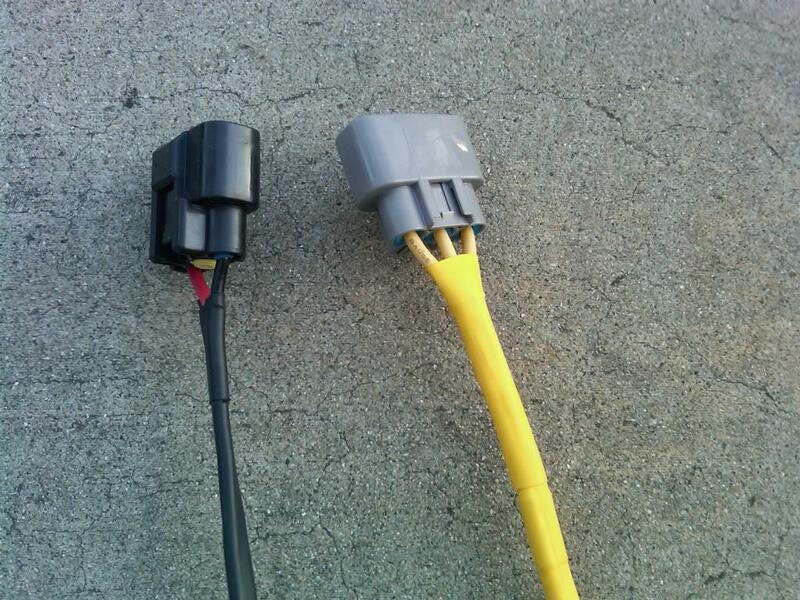 When I tested the OEM R/R (stator connector), pin 1 to 2 was a short in both directions. 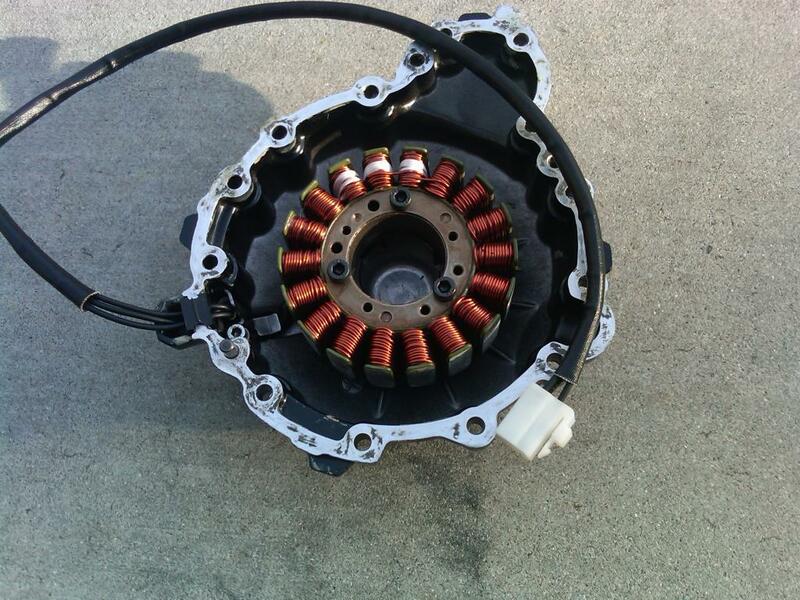 This meant that OEM R/R is a toast and probably the reason for baking the stator. 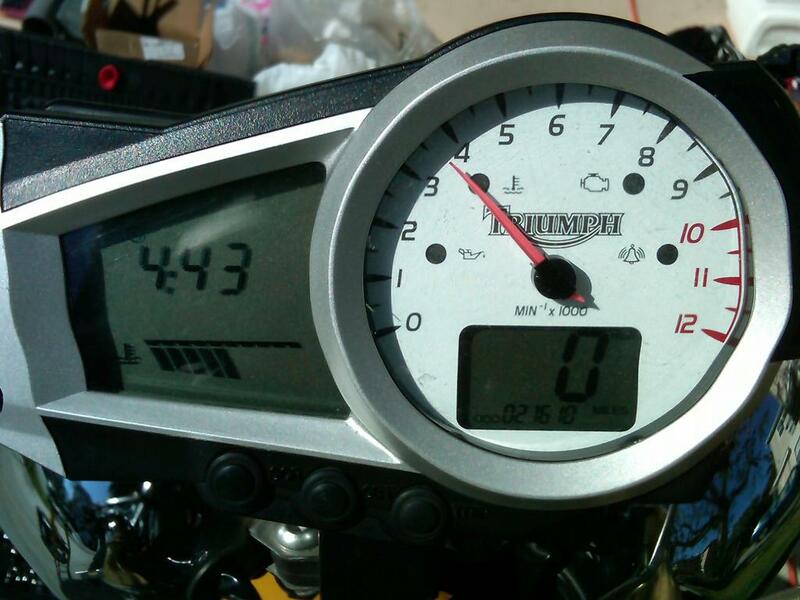 Since I decided to NOT to use OEM R/R, (a few used ones were available on E-Bay for around US$120.00), I searched for Shindigen FH012 based R/R and fond a used one off 2008 Kawasaki ZG1400 Concourse for about $32.00 shipping included (1/3 price of the inferior used OEM R/R .. gotta love E-Bay). 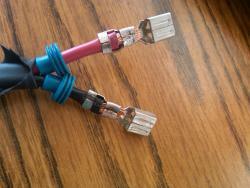 Fururakawa connectors are available from two places that I know of. 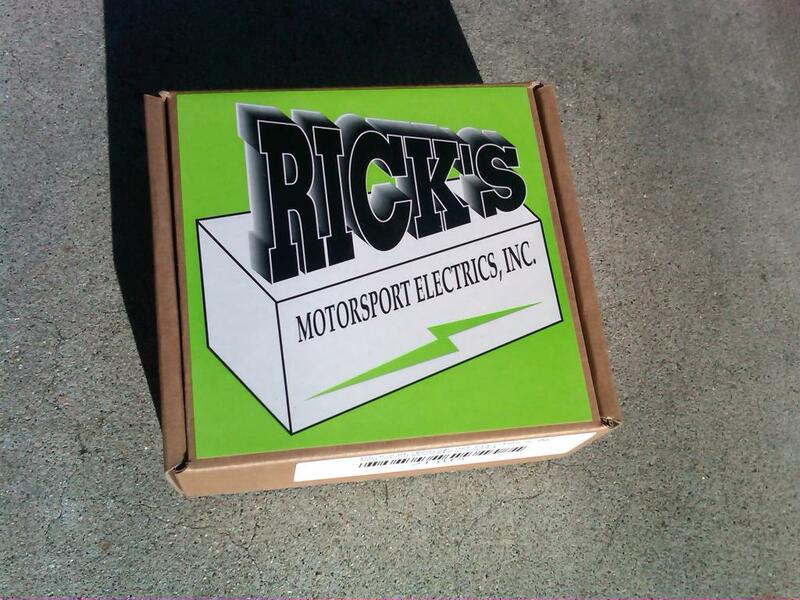 Since I decided to wire my own connectors I ordered them from here (local to me, so I could just pick the parts up). 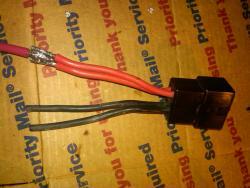 Jack Flemming has the the whole kit if you don't want top hunt for the used FH012 R/R on e-bay. REally good guy and he also builds very cool custom 3 wheelers called "Roadstercycle". If you don't know how to crimp and solder, or don't want to bother with that, you can order the connectors pre-made at Eastern Beaver. So, it becomes a plug and play deal. Below are the parts I purchased to do the stator replacement and R/R upgrade. 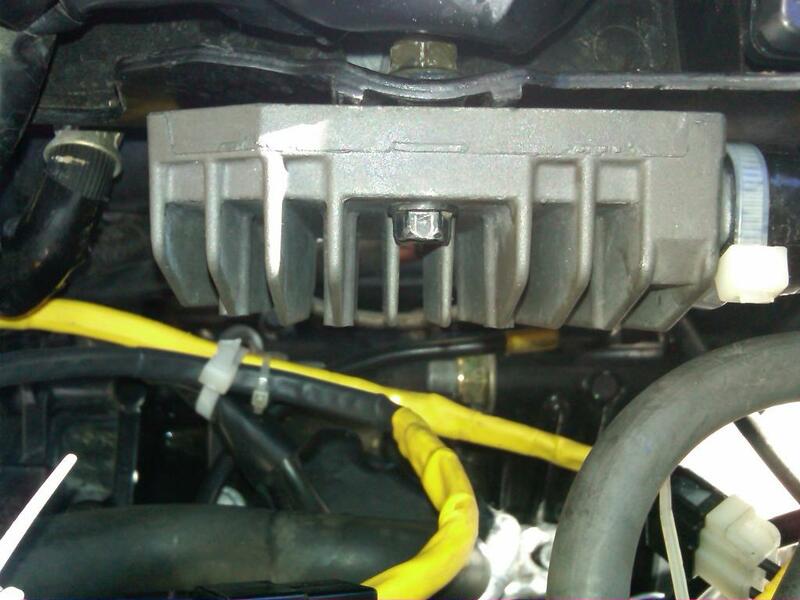 The only item missing is the gasket sheeth that used to make a gasket for the alternator cover (didn't want to wait 10 days for the OEM gasket to arrive). 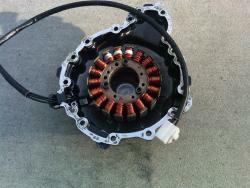 Left to right: FH012 R/R, Stator, Furukawa connectors. 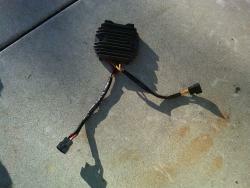 Below is the top view of the OEM R/R. 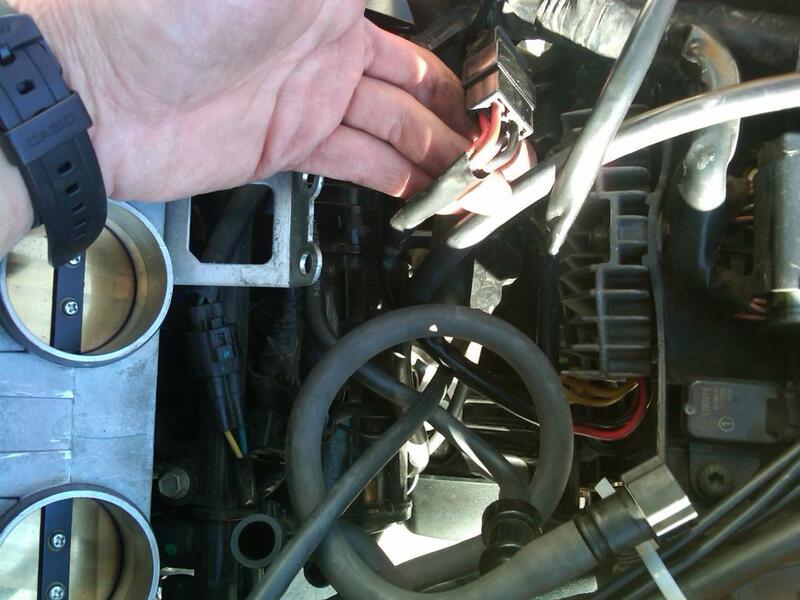 Below, disconnect the DC connector from the OEM R/R and the harness (the AC 3 phase connector from R/R to alternator disconnected earlier during testing). 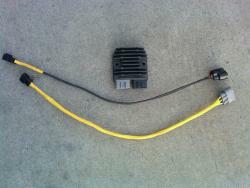 I cut off the connectors from the OEM R/R and used them to make two new R/R harnesses, with OEM Yazaki connectors on the harness and alternator end and the Furukawa connectors on the end facing the FH012 R/R. Below is the conenctor that plugs in to harness and delivers rectified DC to the electrical system. 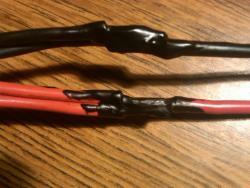 I soldered the two red (positive polarity) wires and a 12ga automotive grade wire together. Once the liquid tape was dry, I covered each joint with a shrink wrap insulation and shrunk it with the help of a hair dryer set on "high". Same procedure as above was repeated for the alternator to R/R wiring harness. 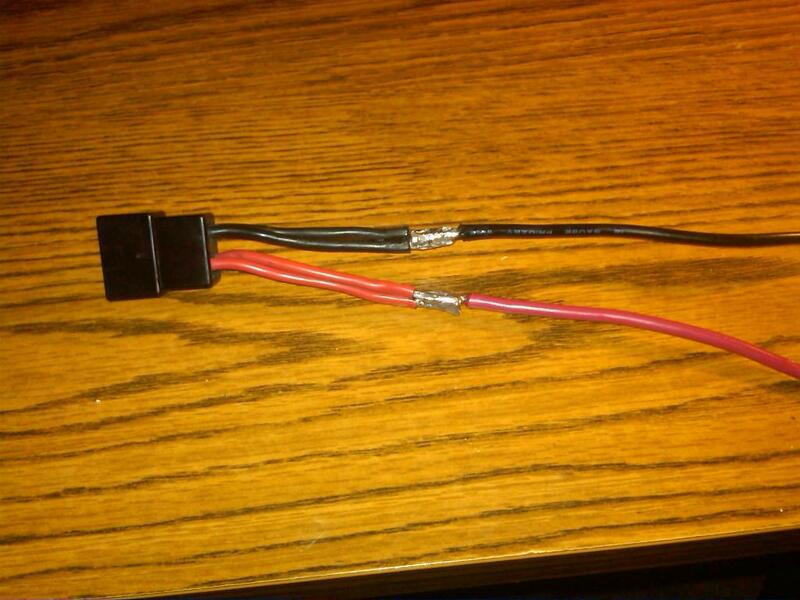 Soldered and liquid taped. Shindigen side of the DC wiring was crimped and then soldered (soldering picture not shown). 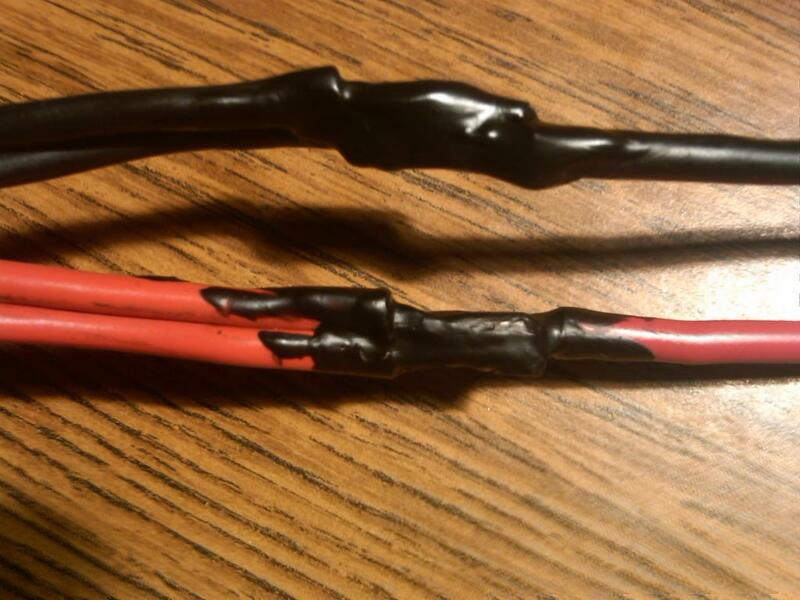 Mental note: DONT FORGET to put all the connectors, and additional shrink wrapping on the wires before crimping and soldering the connectors on. 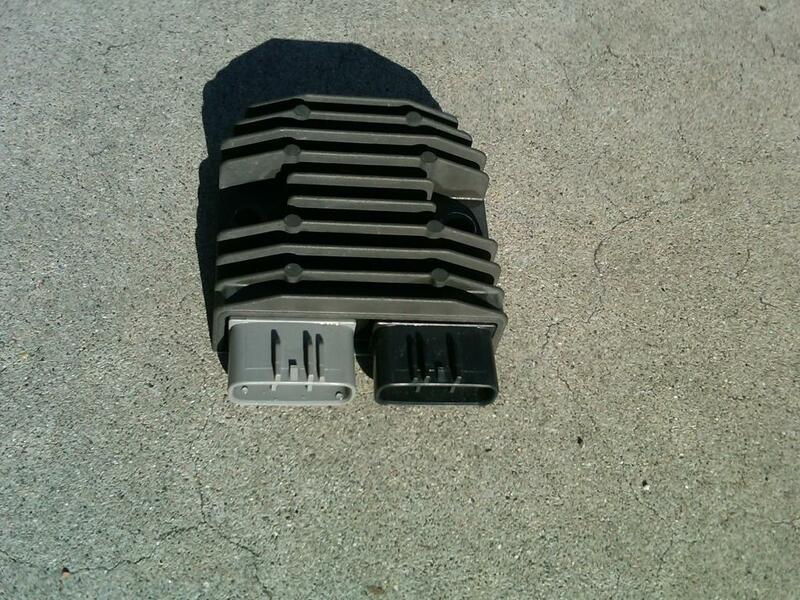 I mounted the FH012 with a top mounting hole. The bottom is a little off so I used a ziptie through the bottom R/R hole + the mounting bracket o secure the bottom part. I figured the top bolt with loctite on it and the bottom with zip tie should hold the R/R securely in place. Will inspect in a few weeks and see if anything come lose. Time to replace the alternator. Removing the alternator cover bolts. 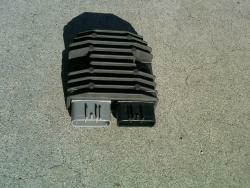 It wasn't easy to remove the cover as the previos owner had it removed and replaced before. 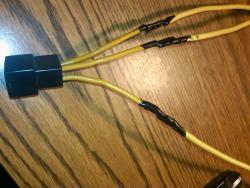 Only he used epoxy to seal it ! !@#$@#$@#% ! It took me 2 hours of thinkering with jewelers scredrivers, varios thin blades and finally GENTLY prying the cover off with a flat blade screwdriver. I managed t only slightly nick the cover surface. Also the powerful permanent magnets hold the stator+cover in place as well. 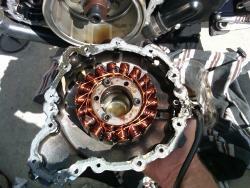 Once the cover was removed I got a look at the old stator. Yep ... one of the top most coils was burned to crisp black. Below engine side picture with alternator cover removed. Note the remnants of the old gasket glued to both the cover and the engine sides. 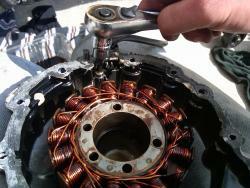 Removing the 3 hex screws that attach stator to the cover case. 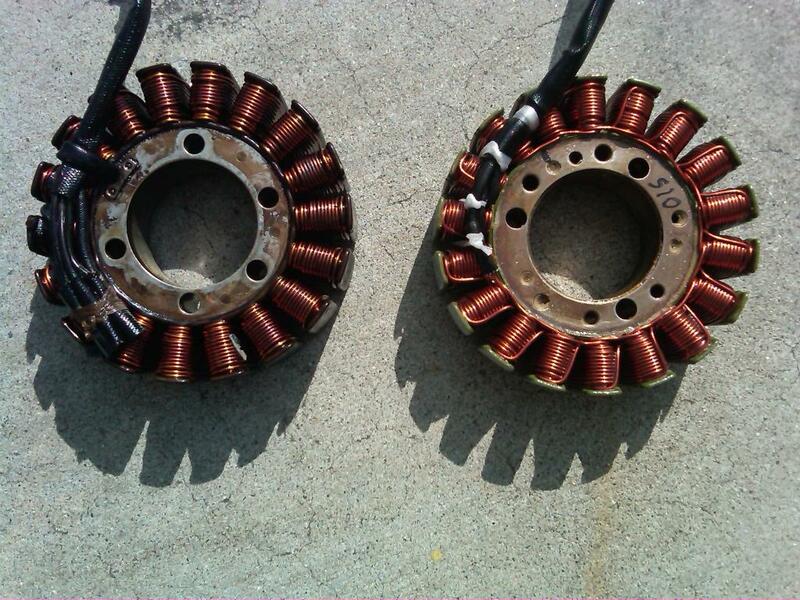 Old (Left) and New (right) stators side by side. 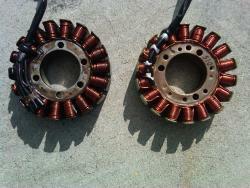 Old Stator. Note the charred coil at the top. 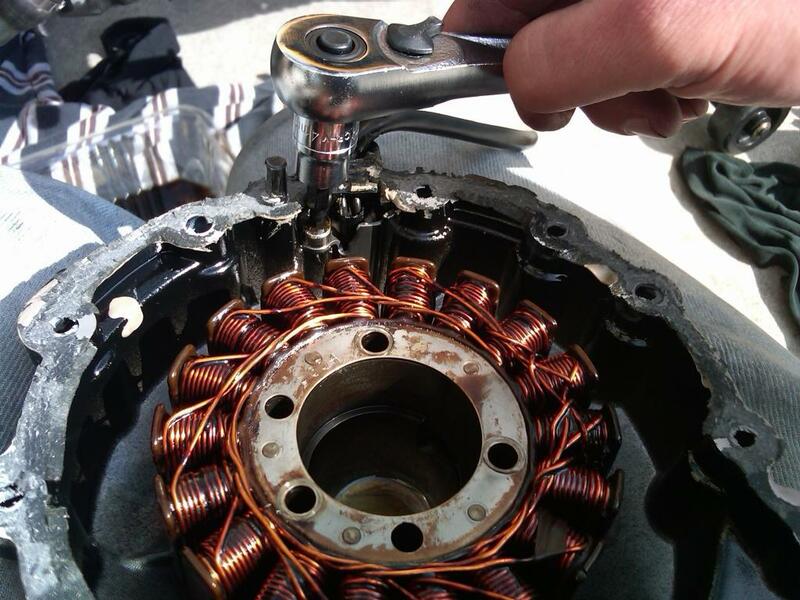 REmoving the remnants of the old gasket from the stator cover. 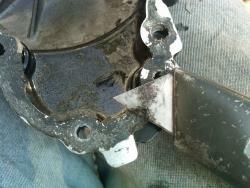 I used the same tool to remove the renmants of the gasket from the engine side. Previous owner's mistakes ended up wasting close to 4 hours of my time just cleaning up the old mess. Stator cower after old gasket was scraped off with a new stator installed. 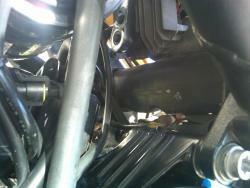 Forgot to take pictures of making the new gasket. 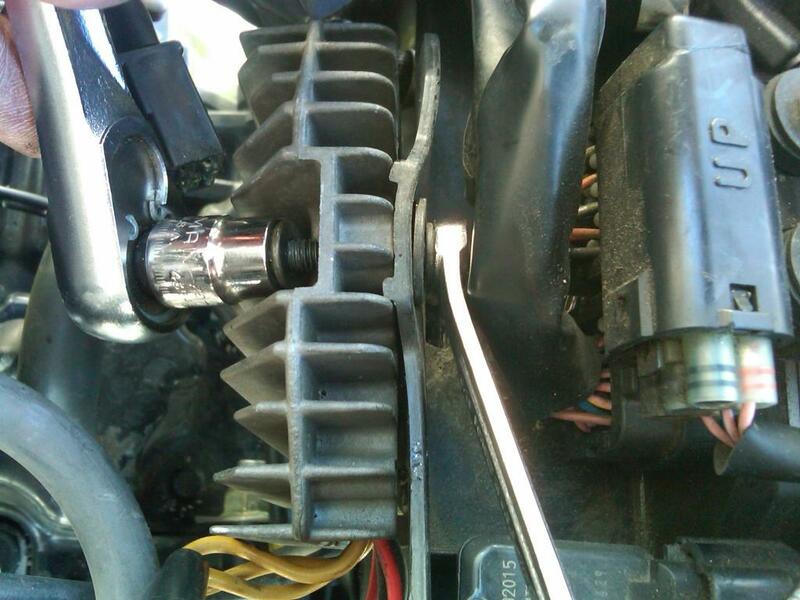 I bought the gasket paper at the automotive store and used a ballpen hammer as shown in the youtube video below to make a new gasket. Took me about 30 minutes and it was actually fun. 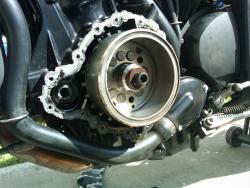 Replaced the old gasket and reinstall the stator cover. 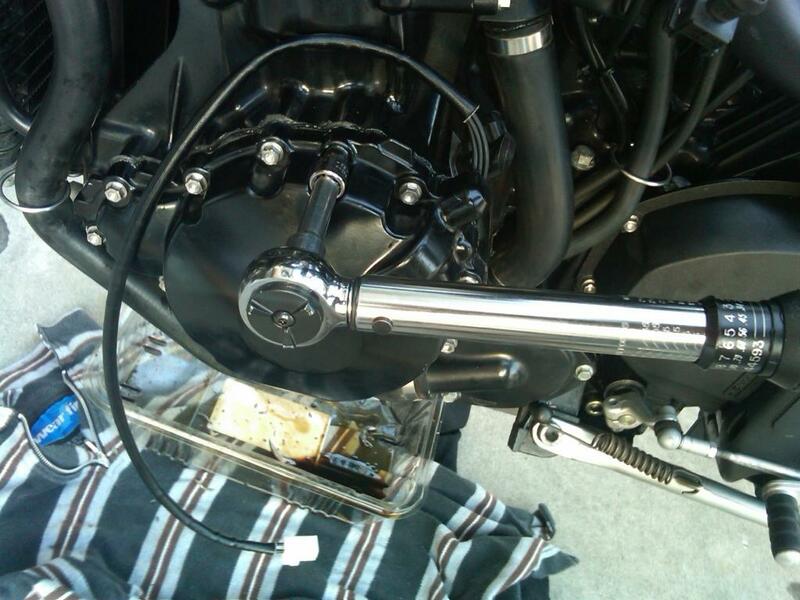 Torque the bolts with the torque wrench to factory specified torque setting (as specified in the service manual). 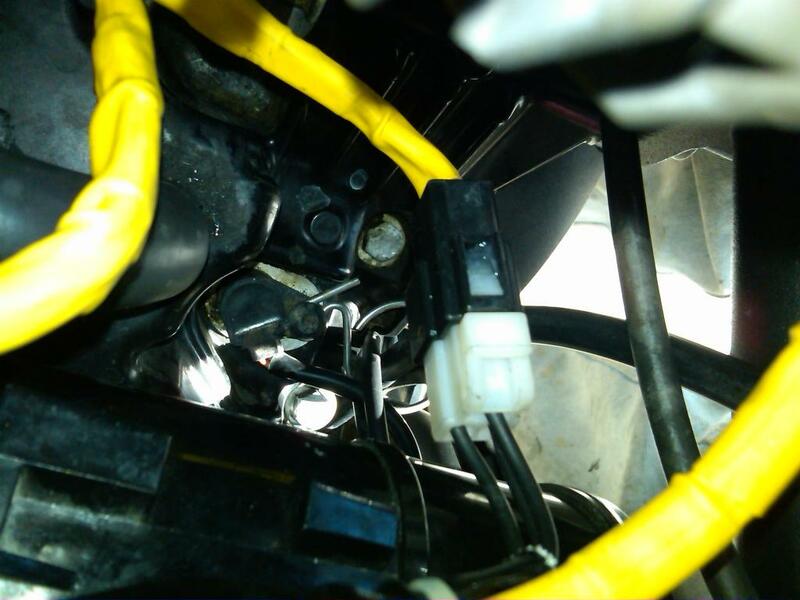 Reconnect the R/R connector to stator. Install the airbox and tank back. Connect the Multimeter to the battery, turn the key, clutch in, thumb the starter button. Thge ngine roared to life !!! The Multimeter reading at 4k RPM. PERFECT !!! 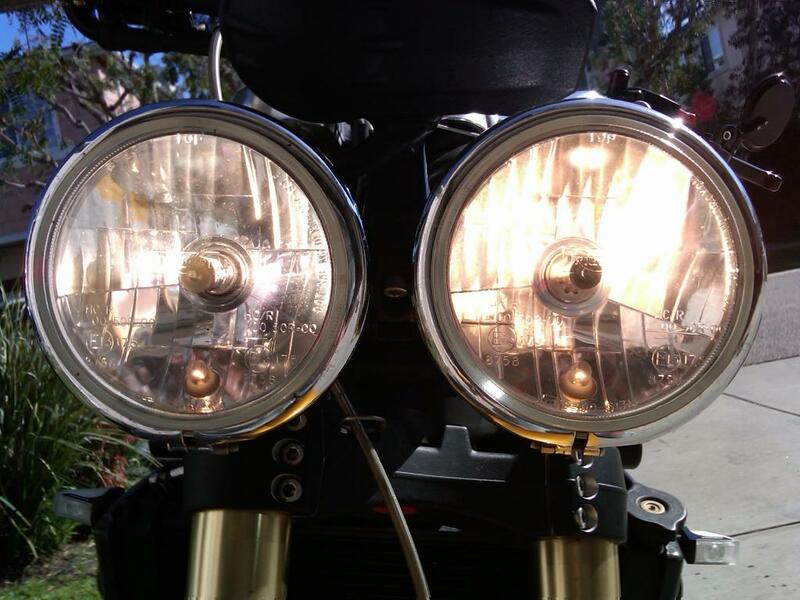 The lights look brighter and when I took the motorcycle on a canyon ride the following weekend, it ran smoother, with better throttle response. Submitted by rnexussix on Wed, 04/20/2011 - 19:27. Thanks for the feedback Mike. 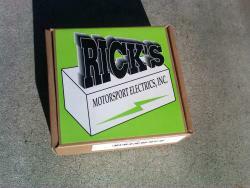 I ordered my stator from Rick's as well. Re. 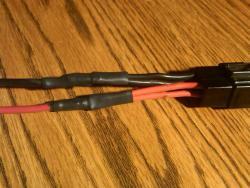 doing the MOSFET R/R upgrade. JUST DO IT. 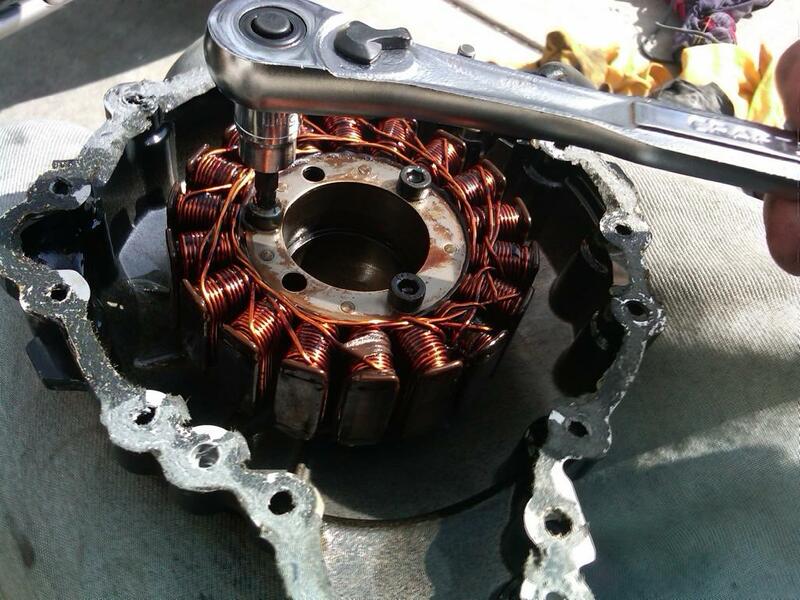 It is only a matter of time before the OEM SCR based R/R will fail and take the stator with it. 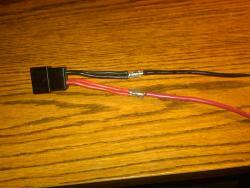 In fact Triumph is replacing the failed R/R's on Street Triple's with MOSFET based R/R (if the bike is under warranty). Switching to FH012 based R/R is the best mod. 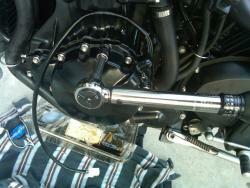 upgrade I have done on my bike. Submitted by rnexussix on Tue, 06/07/2011 - 11:06. You are welcome Jason. Would be curios to see how things work out for you. I'm sure you'll chose to do a few things in a different way. It's all a part of modding your bike. Take some pictures of the process and post them in a how-to here with a little bit of description, if you have a few minutes to spare. Submitted by rnexussix on Tue, 06/21/2011 - 00:30. Congrats on successful upgrade ! Enjoy your S3 and ride safely. Contribute to this site if you can. Never know, your how-to might help someone in need. All the best ! Submitted by rnexussix on Sat, 03/03/2012 - 11:07. Submitted by rnexussix on Thu, 03/15/2012 - 14:48. The wires are interchangeble. 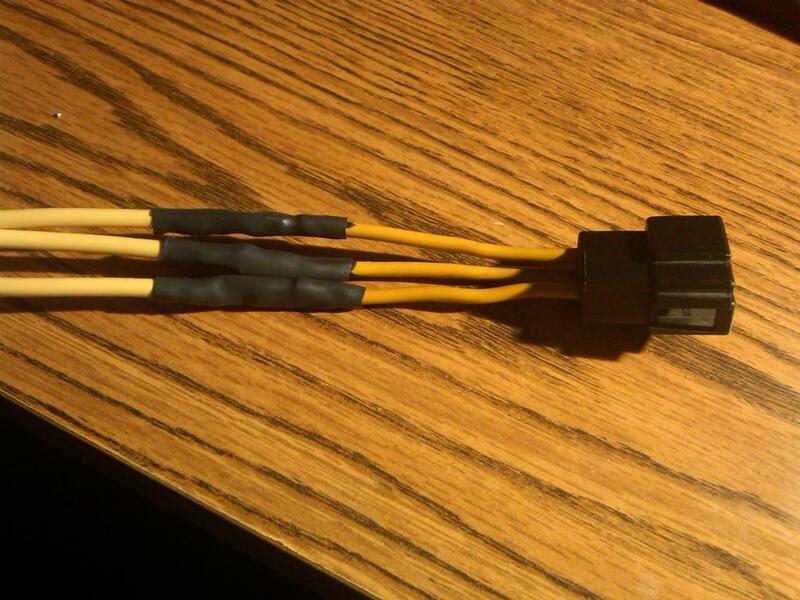 It's a 3 phase AC. Submitted by rnexussix on Sun, 06/24/2012 - 21:04. 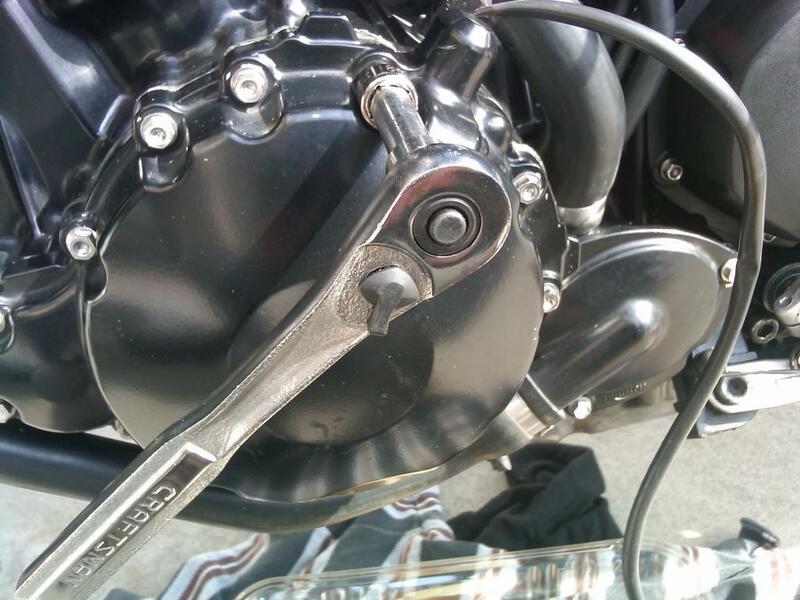 I went with a very thin jeweler's screwdriver blade aroudn the cover to make sure it's not "glued" (previos owner used a weird gasket material), then I looped a rope aroudn the left and the right "lips" of the stator cover then braced with my feet agaist the bike's side and pulled. Smiffo, you are welcome ! Submitted by rnexussix on Sat, 07/14/2012 - 08:37. Smiffo, you are welcome ! Hope your speedie started alright. 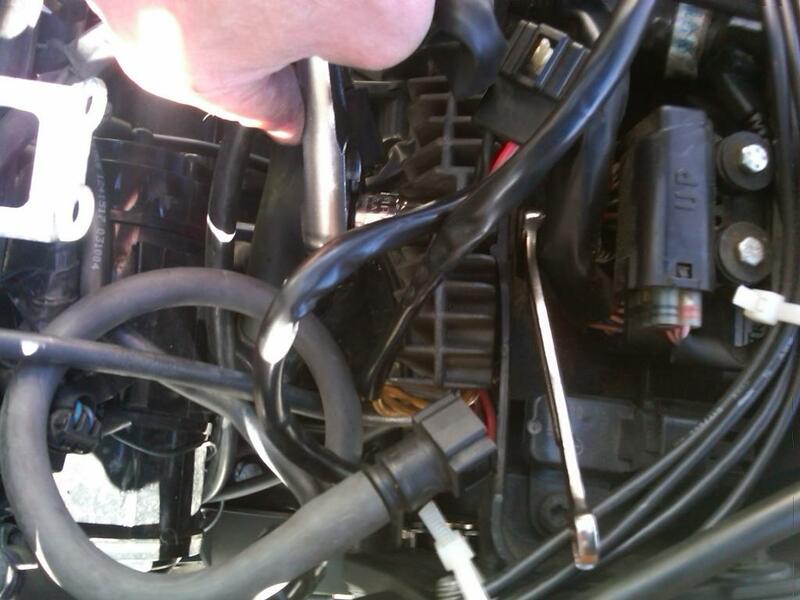 Best of luck and consider sharing a "how-to" of your own. Snap a few pictures of your work and post a little story. That what makes this site interesting after all. Submitted by lewis on Sun, 11/18/2012 - 08:28. 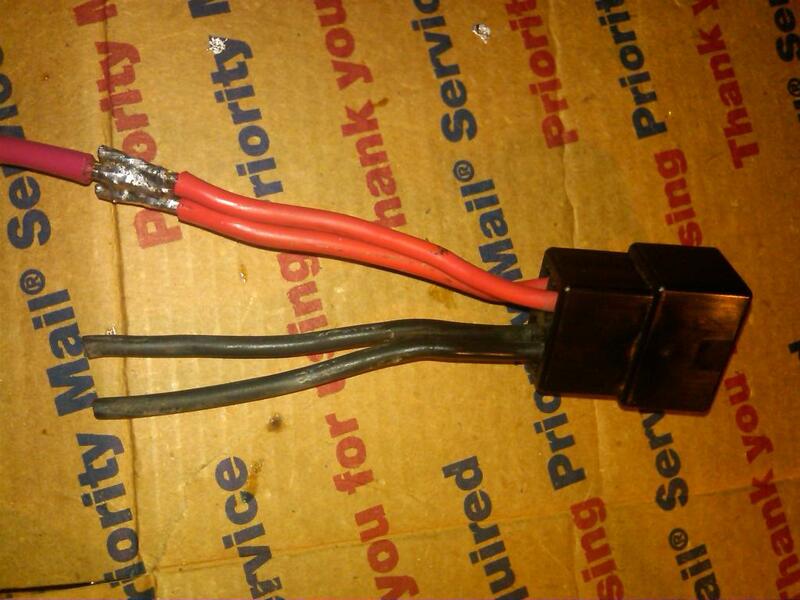 It appears that he Shindengen Rectifier/Regulator (R/R) FH012AA has been superseded by the FH020AA. Little information on their website since they claim that they make so many different versions "please contact to motorcycle dealers" . I plan to replace my R/R purely as a precautionary measure. I haven't had any problems, yet, but there have been a few incidents that leave me doubting the robustness of the charging system. 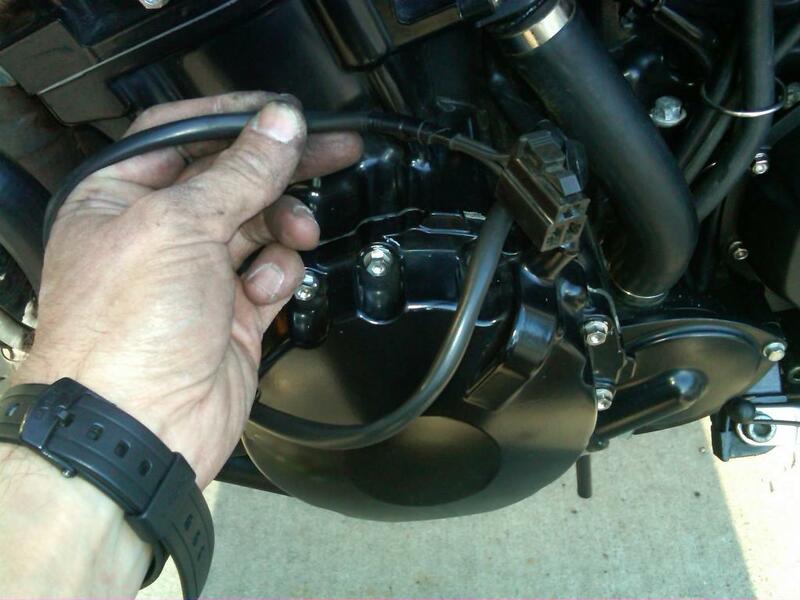 So, I bought a kit with a new FH020AA, plugs, wires, connectors, in-line fuse and sundry bits from Jack Fleming at roadstercycle.com. $120. He also has a machined aluminum adapter/bracket that should allow bolting both ends down. On his website there are several videos demonstrating what to do with the various bits and how to make solid electrical connections. Recommended. I will be changing mine out in the next couple days. If I can find a better place to mount it (like in the air stream?) I will post pictures. Submitted by rnexussix on Mon, 11/19/2012 - 10:47. Thanks for the updated Shindigen info. Looking forward to seeing the pics of your mods. 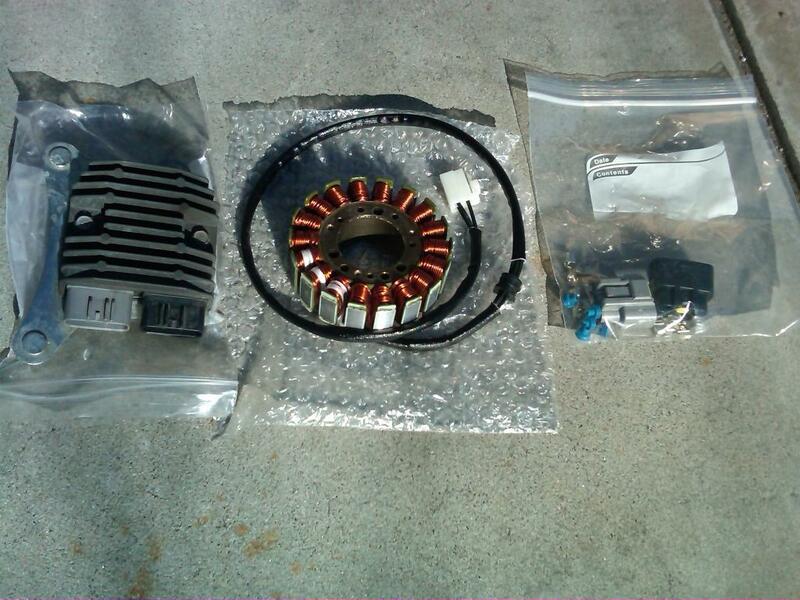 I actually met Jack when I got the R/R connectors from him. He is a good guy, plus he builds very cool machines. 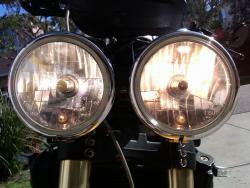 Submitted by Riley Booth on Mon, 06/02/2014 - 04:15. Mate, thanks so much for the R/R upgrade howto. Very useful indeed!